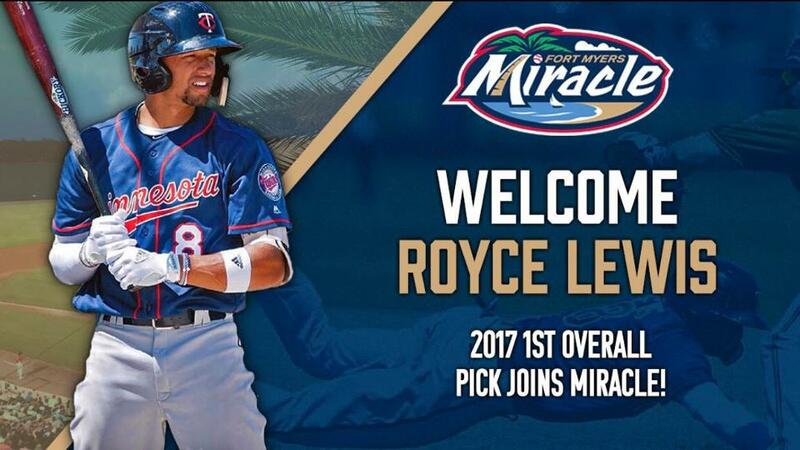 FORT MYERS, Fla. - Royce Lewis, the number one overall pick in the 2017 draft by the Minnesota Twins, has officially been promoted to the Fort Myers Miracle from Class-A Cedar Rapids. His first game with the club will be on Saturday night in Lakeland. Lewis will make his home debut for the Miracle at Hammond Stadium on Monday against the St. Lucie Mets. First pitch is 7:00 p.m.
Lewis, 19, hit .315 with nine home runs and 53 RBI in 75 games for the Cedar Rapids Kernels. He also added 23 doubles and posted a .368 on-base percentage and .485 slugging percentage. Lewis stole 22 bases in 26 attempts. His best month was June, when he hit .330 and blasted five home runs with 22 RBI in 23 games. Lewis was taken out of JSerra Catholic High School in San Juan Capistrano, CA. He is just the second number one overall pick to sign with Minnesota. Six-time MLB All-Star and former AL MVP Joe Mauer, who played with the Miracle in 2003 and 2004, is the other. Lewis was the 2017 Gatorade Player of the Year in California. He made his professional debut with the Rookie-level Gulf Coast League Twins on June 26, 2017 and homered in his first at-bat. In 17 games with the GCL Twins, Lewis hit .271 with three home runs and 17 RBI. He also stole 15 bases in 17 attempts. On August 12, 2017, Lewis was promoted to Low-A Cedar Rapids and finished the season there. In 18 games, he hit .296 with one home run, 10 RBI, and three stolen bases.